Hong Kong based collectible maker ThreeA previously released a jumbo-sized Metal Gear REX figure. And now? Now, it looks like they're working on a jumbo-sized RAY mecha. 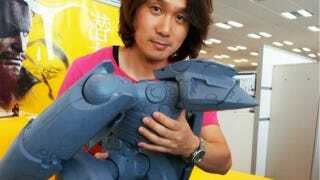 In these photos from Metal Gear creator Hideo Kojima, you can see a prototype of the upcoming RAY figure. That's resident artist Yoji Shinkawa in the pics. As the Metal Gear Wiki points out, the amphibious Metal Gear RAY was originally created in response to the Metal Gear REX. So, it kind of makes sense that this new figure would follow the previously released REX! In case you missed it, here are photos of the finished REX.